One top 2020 recruit that did not visit Texas this weekend was Clear Creek (TX) offensive tackle Chad Lindberg. It was homecoming for Clear Creek so it was a busy weekend for Lindberg and his team. They’re also 4-4 and a win this weekend would be huge for their playoff chances. Lindberg told me he’s just trying to focus on this game and the rest of his season at the moment. He isn’t too focused on the recruiting process right now, but Lindberg does have one visit set up. He will be back at Texas in two weeks when the Longhorns host Iowa State. That will be a big one for the Longhorns to impress on the field with Lindberg seeing the action in person for the first time this season. Texas is in a good spot with the top offensive lineman in the state in 2020 right now. Schools like Stanford, LSU, Alabama, and other blue bloods are coming hard after him though. Lindberg has a really good relationship with Texas’ 2020 commit offensive guard Logan Parr. Lindberg’s older brother is also a student at Texas. The 17th ranked Longhorns (6-2, 4-1) host the 13th ranked West Virginia Mountaineers (6-1, 4-1) in a game that will break a three-way tie atop the Big XII standings. 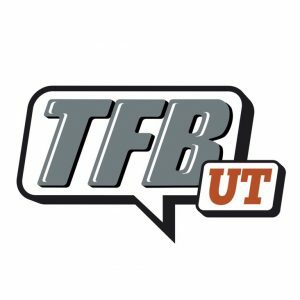 The short-handed Texas Defense is going to have to put forth a tremendous performance today to defeat a West Virginia team that has an offense that appears to every bit as potent as the Oklahoma attack that Texas faced earlier in the season. The West Virginia Defense enters this game 1st in the Big XII in points per game allowed. Texas is expected to be without Senior DT Chris Nelson and Junior Safety Brandon Jones. Senior LB Anthony Wheeler is suspended for the first series of today’s game. Gerald Wilbon, Josh Thompson, and Jeff McCullough are expected fill in their absences, respectively. West Virginia QB Will Grier is one of the best Quarterbacks in the country and enters the game ranking 2nd in the Big XII in passer efficiency and passing yards per game. Texas fans should be familiar with WR David Sills, as he torched Texas last season and is recognized as one of the nation’s best. West Virginia’s trio of Receivers, Sills, Marcus Simms, and Gary Jennings form what will likely be the group that Texas faces this season. Within the first two defensive series, there’s more bad news: Texas loses Senior CB Davante Davis and DE Breckyn Hager to shoulder injuries. Freshman CB Anthony Cook and Sophomore DE Taquon Graham are their replacements. Lil’Jordan Humphrey made a beastly play on a pass from Sam Ehlinger to get the ball to the WVU 1-yard line on Texas’ 2nd drive, setting up an Ehlinger TD run on the next play. The combo would then hook up on the next offensive drive for a 21-yard TD pass to put Texas up 14-10. Humphrey is also the Horns’ primary Kick Returner today. His versatility is extremely rare for a player with his size, being featured split out, in the slot, as a Wildcat QB, and as a Running Back. We may very well be watching Humphrey play his last season in Austin. West Virginia LT Yodny Cajuste, who is a preseason All-Big XII selection, was just ejected for throwing a punch at Jeff McCullough following an extra point attempt. This may be a huge development for Texas. Texas blows an assignment in coverage, which leads to a 60-yard touchdown catch for Sills. It’s already going to be difficult enough to slow down this WVU attack, Texas can’t afford mental mistakes that make it easy. I really wish the announcers would stop complaining about the officials. I understand you disagreeing with the call and voicing your opinion, but, the calls were made and they aren’t going to go back and reverse them. It was not a harmless shove, Cajuste threw a punch. Move on, please. There’s a great game going on that I’m sure the viewers would rather hear about. Meanwhile, Sills beats Josh Thompson on a fade route for his 2nd TD catch of the game. 17-14 WVU. Sills has 84 yards and 2 touchdowns one minute into the 2nd quarter. I’m sure that Texas fans are struggling to suppress flashbacks to Tylan Wallace last week. An adjustment needs to be made. Ehlinger is going to have some explaining to do to Jerrod Heard after leaving him completely out to dry over the middle of the field. West Virginia’s Kenny Robinson, Jr. did exactly what he is supposed to do when presented that opportunity. Heard had to be helped off the field. Ehlinger would bounce back on a strike to Collin Johnson a few plays later to set up a 5-yard TD run for Tre Watson. Texas responds and regains control of the lead. 21-17. A missed Caden Sterns tackle leads to a 55-yard TD run for West Virginia’s Martell Pettaway. Marqez Bimage has to be helped off the field following the extra point. Texas defenders are officially dropping like flies. Freshman DT Moro Ojomo has made what I believe is his season debut, today. 21-17 WVU. Tre Watson is a heck of a receiver out of the backfield. Texas runs a slant-flare combination which gets Watson the ball in space versus a LB with momentum. The result is a 32-yard touchdown for UT. The Cal transfer has been a heck of an addition for Texas in more ways than one. 28-24 Texas. Texas made a mistake calling a timeout on the WVU Field Goal attempt to end the 1st Half. WVU Kicker Evan Staley missed two field goals in the 1st quarter last week against Baylor. There was no need to try to “ice” him in that situation and essentially give him a practice kick. Naturally, he missed the one that didn’t count and nailed the retry. Regardless, holding WVU to a Field Goal and taking the lead into Half while receiving the ball to start the 2nd Half is a victory for Texas. That 1st half took almost 2 hours in real time. Incredible. A combined 55 points, 18 penalties, and multiple play stoppages for injuries will do that. At half, West Virginia has a 348-266 edge in total yardage, 206-189 through the air, and 142-77. West Virginia was penalized 12 times for 95 yards, while Texas was penalized 6 times for 54 yards. Texas won the time of possession battle in the 1st half 16:20-13:40. The Longhorns are undefeated this season when they win the TOP battle. Texas caught a HUGE break when Lil’Jordan Humphrey’s fumble went out of bounds after a 28-yard gain on the 1st drive if the 2nd half. The first time Sam Ehlinger had Andrew Beck up the seam on an RPO he missed him. The second time around, Beck failed to get his eyes around in time. Two missed TD opportunities for Texas. They would try it again in the 4th quarter, this time connecting for a gain of 19 yards. Texas’ gamble on 4th and 1 doesn’t pay off, the Horns turn the ball over on downs at the West Virginia 4-yard line. If Texas ends up not winning this game, Tom Herman’s decision to call timeout at the end of the 1st Half and to go for it on 4th and 1 in easy Field Goal range will receive a ton of scrutiny. Taquon Graham with a big-time flash play on his 3rd down TFL to force a West Virginia punt. The Horns have a TON of Freshman and Sophomores playing on Defense in this one and they are holding their own. Did I mention that Texas fans should probably enjoy Lil’Jordan Humphrey for the time that he has left this season?? He made a second highlight play of the day on a 29-yard grab right off of the top of the defender’s head. WHAT. A. STOP. The Texas Defense answers the bell on 4th on 1 from their own 20-yard line to end the 3rd Quarter. PJ Locke got the initial penetration, while Gary Johnson and Taquon Graham where there to clean it up. Graham has looked very good today in Breckyn Hager’s absence. Malcolm Roach hasn’t played a ton today, but his presence has been felt. The Longhorns held West Virginia scoreless in the 3rd quarter. The Texas Offensive Line is starting to enforce their will on the opening drive in the 4th quarter. Texas is playing with the type of attitude upfront that hasn’t been seen since the Kasey Studdard days. That attitude rubs off on the rest of the team. Running Backs start to run a little harder, Receivers start to cover up Defensive Backs a little longer, the Defense gets some rest and a morale boost when their efforts are rewarded by the Offense. A holding penalty stalls out what was a very promising drive and Texas has to settle for a 38-yard Cameron Dicker Field Goal. Texas’ last 3 possessions have ended deep in West Virginia territory but only yielded 6 points. Kris Boyd did a great job finishing the play to break up a would-be touchdown as Sills had a step on him deep. Boyd has done a terrific job in the 2nd half, as Sills has been a non-factor. How about Freshman Anthony Cook keeping his composure and not panicking after he was beaten in the end zone. Cook rallied through the Receiver and was able to break up the pass. The future is bright for the Texas secondary. Unfortunately, on the next play, Senior LB Anthony Wheeler fails to scrape over the top and fill his gap, leading to a 13-yard Touchdown run by Martell Pettaway. Pettaway and Kennedy McKoy have combined for 195 yards and 2 touchdowns on 23 carries. 34-34 tie ball game, 5:40 remaining. What a catch by Andrew Beck on a low ball to convert the 3rd and 2 and keep the potential game-winning drive alive for Texas. Ehlinger would then hit Devin Duvernay on a from 48 yards out on a double move to give Texas a 41-34 lead. Sam Ehlinger’s progression this season has been a joy to watch. You have to credit Tim Beck and Tom Herman on the way they’ve handled the QB room since arriving in Austin. They made the right decision. Will Grier has had all day to go through his reads today on pass plays. Would be nice to see Texas get some pressure on this final drive. Both young Texas safeties, Josh Thompson and Caden Sterns allow Gary Jennings to get behind them as Grier drops a dime for a 33-yard TD. Back-breaker. While calling a timeout to end the 1st half was a mistake, calling a timeout right before the snap of the 2-point conversion was definitely the right call. True Freshman CB Anthony Cook was matched up on All-American Senior WR David Sills. West Virginia got away with a hold by the Left Tackle on Will Grier’s two-point conversion play. West Virginia takes the lead 42-41 with 16 seconds left. What a gutsy decision by Dana Holgerson. I feel like Texas made a big mistake by not taking an easy throw in the middle of the field with 9 seconds left. The clock would have stopped on a 1st down and Texas would have had time for a spike and field goal attempt. That play was the only egregious mistake that I feel like Sam Ehlinger made all day, outside of leading Jerrod Heard’s ribs to destruction. Will Grier finished the game 28 of 42 for 346 yards and 3 touchdowns. West Virginia RBs Martell Pettaway and Kennedy McKoy finished the game with a combined 26 carries for 210 yards and 2 touchdowns. David Sills was held to 1 catch for 13 yards in the 2nd half but finished with a total of 6 for 97 yards and 2 touchdowns. Sam Ehlinger was 24 of 35 for 356 yards and 3 touchdowns. Tre Watson was the Horns leading rusher with 14 carries for 80 yards. Lil’Jordan Humphrey and Devin Duvernay both eclipsed the 100-yard receiving mark. Humphrey amassed 9 receptions for 143 yards and a score, while Duvernay added 6 receptions for 100 yards and a score. Collin Johnson had a relatively quiet 4 for 50 yards. In a game where Texas only punted once, didn’t turn the ball over, and won the Time of Possession battle, you would think that that would have been more than enough to get the victory. The total yardage ended up being a virtual wash. Sam Ehlinger at the very least matched the performance of Will Grier, who had all day to throw today and I don’t recall being sacked or even pressured much. In a game that you knew would be a high-scoring affair, Texas missed too many opportunities in the 2nd half to take points when they were there. Texas had 3 drives stall deep in WVU territory, resulting in only 6 of a possible 21 points. That ended up being the difference in this ballgame, along with a short-handed and young defense facing an NFL-caliber passer. The Texas Defense does have questions that they need to answer and get figured out ASAP, not the least of which is what they are doing early in games, as today marked the 7th time in 9 games that they’ve allowed points on the opening drive. Texas (6-3, 4-2) no longer controls its’ own destiny and tough matchups at Texas Tech and at home versus Iowa State in consecutive weeks still loom. This was a crushing defeat for Texas, but they cannot let WVU beat them twice, they have to move on and be ready to play next week or they risk losing what was looking like a very, very promising season just two weeks ago. Texas will need to take care of their own business while keeping their fingers crossed that WVU beats Oklahoma when they see each other, as Texas holds the tiebreaker over the Sooners. The Horns are close to getting over the hump, but they’re not quite there yet and may need a little push from the team that they just lost to today. ***Sounds like things were going well with 2019 RB, Noah Cain. Sources say it’s going to be hard for Noah to say no to someone like Stan Drayton. Apparently, Drayton is somewhat of an uncle/father type figure to Noah. Source also said, “Noah is at home in Austin. A lot of familiar faces”. If LSU lands Emery, it makes Texas’ chances that much stronger. ***On Elijah Higgins source said, “Kid is going to Stanford”. Unless of course, that falls through. If it falls through then Texas but he’s likely to get in. ***In case you missed it, high upside 2019 OT, Isaiah Hookfin picked up an offer this past weekend. Am told the staff wanted to get a look at him in person. When I saw him, I estimated he was between 6’4 and 6’5. Staff saw the same. Also, he has a big wingspan. So he has tackle size and length.